Phosphorylation is fundamental to the regulation of almost all aspects of cellular function and is carried out by a variety of kinases. During phosphorylation, the γ-phosphate of adenosine-5’-triphosphate (ATP) is transferred to an acceptor substrate, resulting in the release of adenosine-5’-diphosphate (ADP) as a by-product. The ADP-based phosphatase-coupled kinase assay described here offers a new method for measuring kinase activity. This non-radioactive assay couples the phosphatase CD39L2 with kinase reactions to quantitatively release the β-phosphate from ADP. The released phosphate group is then detected using colorimetric Malachite Green-based reagents. Since CD39L2 hydrolysis of ADP displays a first-order rate constant, relatively simple equations can be derived to calculate the coupling rate for CD39L2-coupled kinase reactions. 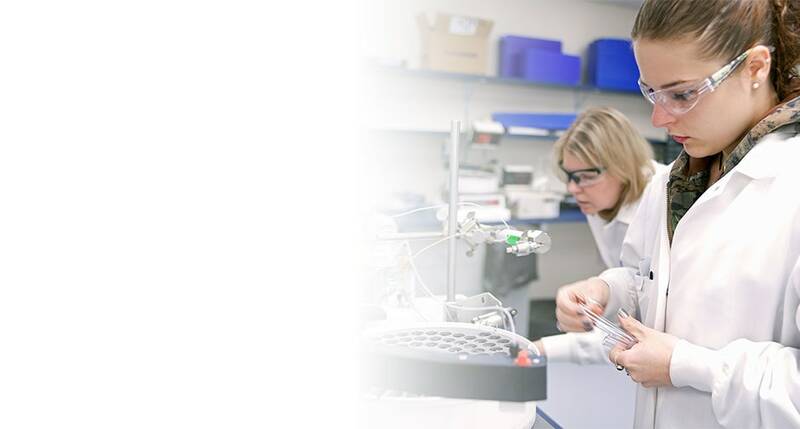 This assay is demonstrated using human Glucokinase (GCK), Penicillium chrysogenum Adenosine 5’-phospho-sulfate Kinase (APSK), and human Extracellular Signal-Regulated Kinase 1 (ERK1). View Larger Image STEP 1 In a 96-well plate, prepare a reaction mix containing ATP, the acceptor substrate, and CD39L2 in buffer. STEP 2 Initiate the reaction by adding a specific kinase. STEP 3 Stop the reaction and develop the color using the Malachite Green Phosphate Detection Kit (Catalog # DY996). Read the absorbance at 620 nm with a plate reader. Reaction Buffer: 25 mM Tris, 150 mM NaCl, 10 mM MgCl2, 10 mM MgCaCl2 at pH 7.5, unless otherwise noted. View Larger Image FIGURE 1. (A) pH profile of CD39L2 activity with ADP (blue line) or ATP (red line) at room temperature. CD39L2 has an optimal pH of 5.5 and is selectively active on ADP throughout the pH range. 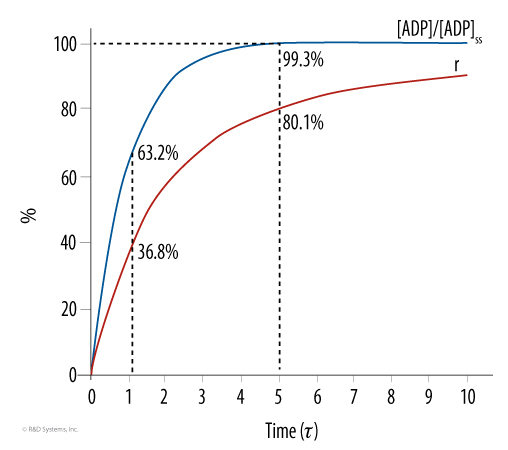 (B) First-order rate constant of CD39L2 for ADP (blue line) or ATP (red line) at pH 7.5. The specific rate constant of CD39L2 for ADP or ATP was determined to be 41.0 and 0.7 nmol•min-1 mM-1•μg-1 (the slopes of the curves), respectively. View Larger Image FIGURE 2. 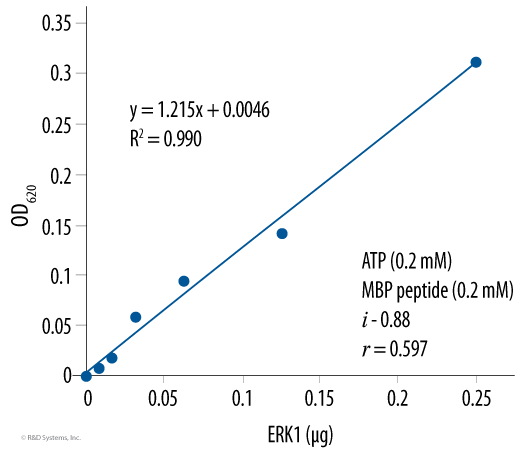 [ADP]/[ADP]ss (blue line) and r (red line) are plotted against the number of τ, the lagging time of the coupling reaction. Coupling rate is the percentage of product that has been converted to the signal by the coupling reaction. Steady state is reached when the velocity of the coupling reaction equals the velocity of the primary reaction. [ADP]ss is the concentration of ADP at the steady state. The coupling rates were calculated using 49 nmol/min/μg for the CD39L2 rate constant for a 20 minute reaction carried out in a volume of 50 μL and adjusted for ATP inhibition. View Larger Image FIGURE 4. GCK is expressed in insulin-secreting pancreatic beta cells and hepatocytes, and it acts as a sensor for circulating glucose levels. All reactions were carried out at room temperature. (A) A glucose curve in the presence of 0.12 mM ATP, 0.2 μg GCK, and 0.3 μg CD39L2 in 150 μL for 15 minutes. (B) An ATP curve in the presence of 20 mM glucose, 1 μg GCK and 0.1 μg CD39L2 in 50 μL for 25 minutes. A no-kinase negative control was performed for each ATP concentration to correct for background. 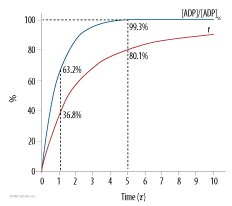 The OD readings of the reactions (black line) were first corrected with background subtraction (blue line) and further corrected for ATP inhibition (red line) and finally fit to the Michaelis-Menten equation. (C) A GCK dose curve in the presence of 10 mM ATP, 20 mM glucose, and 0.2 μg CD39L2 in 50 μL for 25 minutes. The slope of the curve corresponds to a specific activity of 2416 pmol/min/μg using the conversion factor of 3500 pmol/OD and the coupling rate of 0.396. View Larger Image FIGURE 5. APSK is an essential enzyme for the synthesis of PAPS, the active sulfur donor for sulfotransferases. All reactions were carried out at room temperature (A) An adenosine 5’-phosphosulfate (APS) curve in the presence of 0.12 mM ATP, 0.1 μg APSK, and 0.3 μg CD39L2 in 150 μL for 10 minutes. (B) An ATP curve in the presence of 100 μM APS, 0.2 μg APSK, and 0.3 μg CD39L2 in 150 μL for 15 minutes. 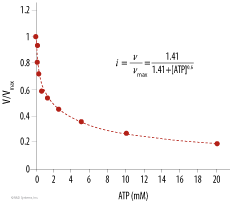 The OD readings (black line) were first corrected by background subtraction (blue line) and then corrected by the ATP inhibition factors (red line). 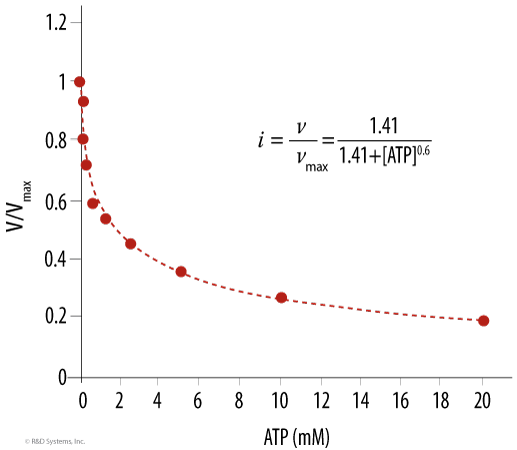 (C) An APSK dose curve in the presence of 1 mM ATP, 0.1 mM APS, and 0.14 μg CD39L2 in 50 μL for 20 minutes. 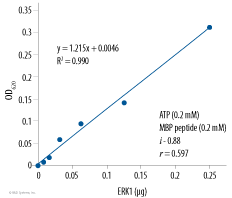 The slope of the curve corresponds to a specific activity of 1125 pmol/min/μg using the conversion factor of 3500 pmol/OD and the coupling rate of 0.61. View Larger Image FIGURE 6. The activity of Recombinant Human ERK1 (Catalog # 1879-KS) was assayed in the presence of 0.2 mM ATP, 0.2 mM myelin basic protein (MBP) peptide, and 0.2 μg CD39L2 in 50 μL at room temperature for 15 minutes. The slope of the curve corresponds to a specific activity of 482 pmol/min/μg using the conversion factor of 3500 pmol/OD and the coupling rate of 0.597. View Larger Image FIGURE 7. Z’ factor quantitatively describes the separation between the signal (red line) and the background (blue line). 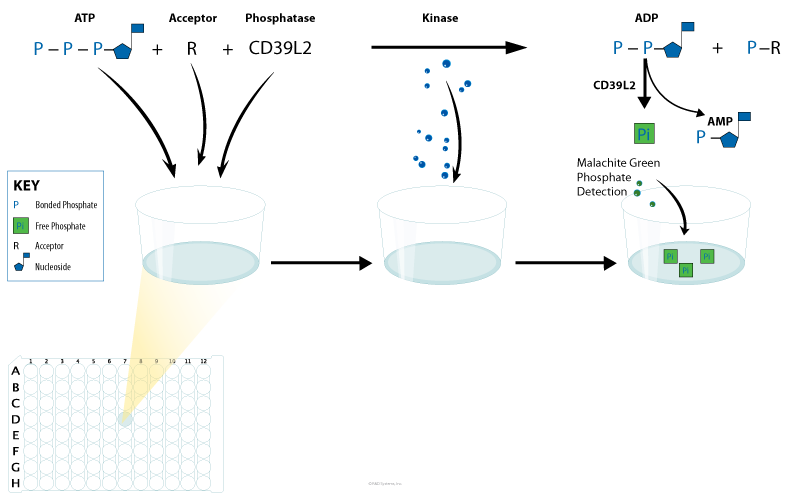 Good separation is essential for an assay to be compatible for high-throughput screening. All reactions were carried out in 150 μL at room temperature. (A) GCK reactions in the presence of 20 mM Glucose, 0.1 mM ATP, 0.64 μg GCK, and 0.1μg CD39L2 for 20 minutes. (B) APSK reactions in the presence of 0.0625 mM APS, 0.125 mM ATP, 1 μg APSK, and 0.15 μg CD39L2 for 15 minutes. (C) ERK1 reactions in the presence of 0.05 mM MBP, 0.1 mM ATP, 0.2 μg ERK1, and 0.1 μg CD39L2 for 20 minutes. CD39L2 displays first-order rate constants on both ADP and ATP when their concentrations are below 0.15 mM. CD39L2 is 50 times more active on ADP than on ATP. The CD39L2-coupled assay is universally applicable to kinase reactions that produce ADP. The CD39L2-coupled kinase assay is colorimetric based and requires no labeling procedures. The CD39L2-coupled kinase assay requires no separation of product and substrate. The CD39L2-coupled kinase assay is direct and quantitative because it involves only one coupling step. The CD39L2-coupled kinase assay is compatible for high-throughput screening.